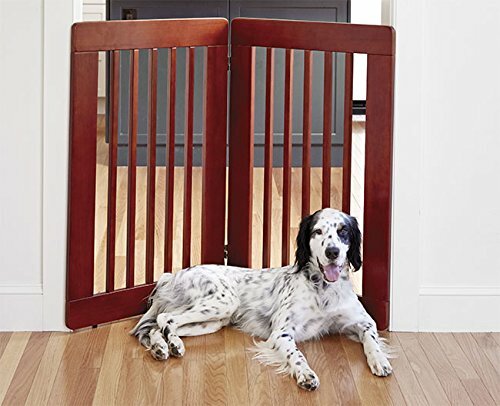 Our free-standing wooden dog gate is an easy and great-looking way to protect your dog from dangerous areas in your home. Simply unfold and stand up to create a barrier just about anywhere—no wall attachment required. Double-jointed hinges allow for multiple configurations. Crafted of New Zealand pine with mortise-and-tenon construction. Not intended for use as a child safety gate. In dark cherry. New Zealand pine. ImportedEach two-panel section covers a 3' span. Panels are 24" wide. Distance between spindles is 2" Free Shipping on all orders $150 or more for all Orvis Products. Limited Time Only!